This shop has been compensated by Collective Bias, Inc. and its advertiser, MARS Incorporated. All opinions are mine alone. 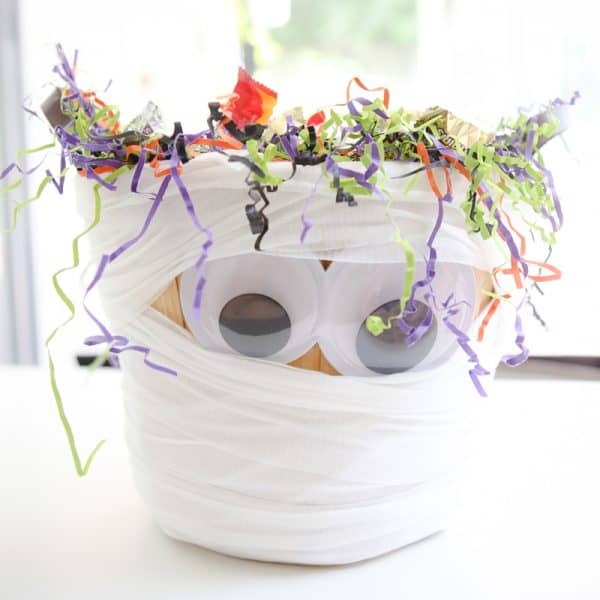 #SpookySavings #BOOItForward #CollectiveBias Ready to shop for some BOOtastic candy? Hover over the photo below to click through to SamsClub.com to purchase! October is here and that means Halloween is getting closer and closer. This is my favorite time of year for our neighborhood because we get to see all the kids dressed up. Our neighborhood is also the go-to trick or treat neighborhood. Everyone, and I do mean everyone, for miles around trucks there kids into our neighborhood. It’s literally bumper to bumper Halloween night with kids everywhere! It’s a little bit overwhelming but also completely amazing at the same time. And I am so completely grateful for all those trick or treaters – I’m happy to give candy to all of them. After literally having not one trick tor treater at any address we’ve ever lived at in my entire life, except this house, I feel like the luckiest person ever. I always decorate our lawn with fun things and have a strobe light going with spooky music playing in the background. We have so much fun on Halloween night! I also like to make a little BOO Basket every halloween. I take it to my husband’s office for everyone there. It’s such a fun way to BOO everyone! For this basket, I took a basic basket I found at the craft store, bought some googly eyes at the craft store and wrapped in gauze and secured it with a little hot glue. I added a little colorful paper at the top for a little crazy look too with hot glue too. Isn’t it too cute! I also like to make some sweet treats for family and friends this time of year with my favorite candies. 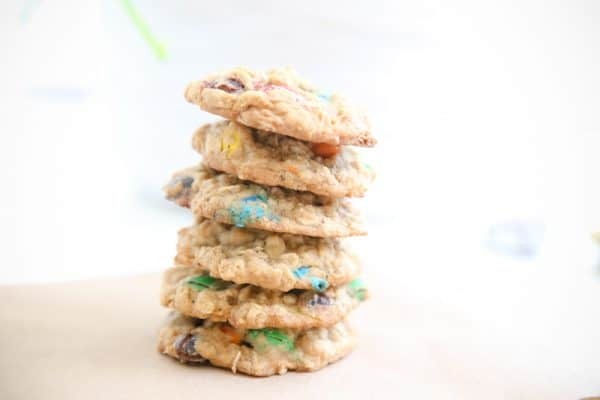 Here I have taken M&M’S® candies and made these little oatmeal cookies. These are so good and such a fun treat to share with the ones you love. Everyone will love these! I’ll be adding little individually wrapped packages of these homemade cookies to my BOO Basket to take as a treat to my husband’s office too. I know they are going to love them! 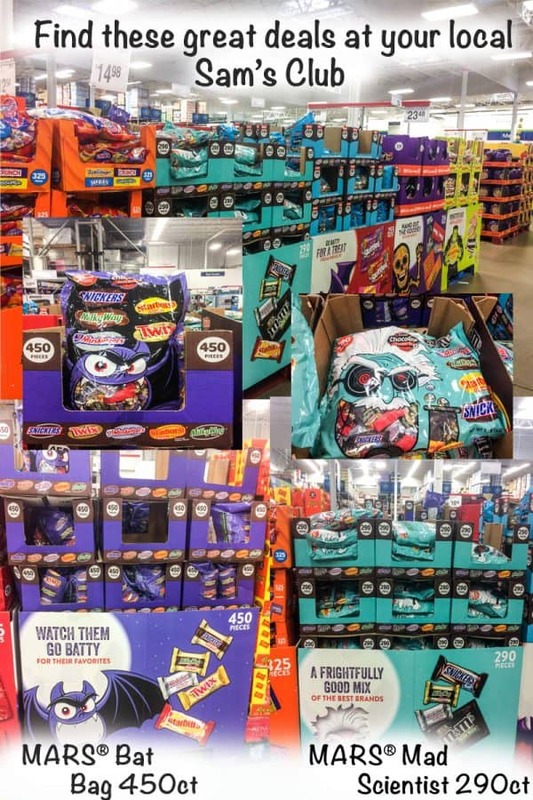 You can do all your BOO’ing for all your family, friends and coworkers by buying your favorite MARS® and Wrigley products at your local Sam’s Club. Buying candy in bulk and saving is what I love to do! Large packs allow you to get BOO’ing essentials on a budget! These bags have all your favorite candies: Skittles®, Starburst®, M&M’S®, TWIX®, SNICKERS®, MILKY WAY® and 3 MUSKETEERS®. You find these great deals on your favorite candies at Sam’s club. 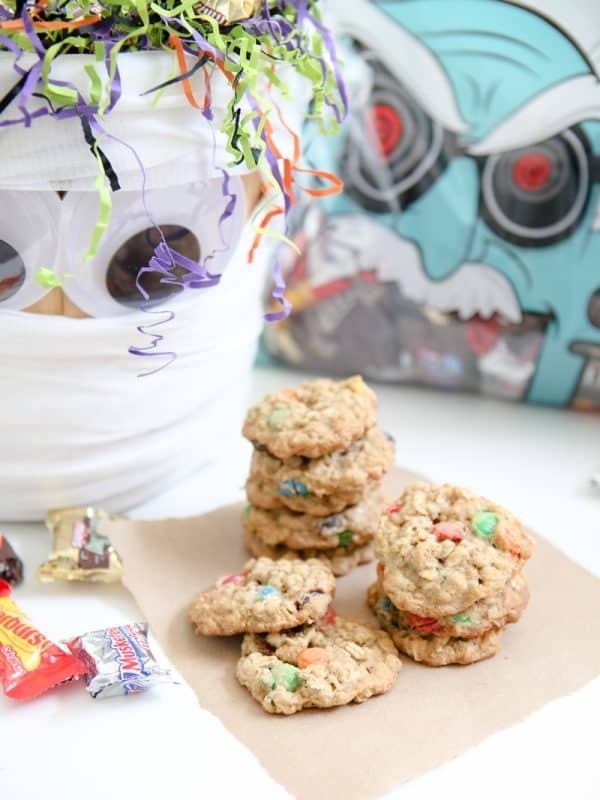 The MARS® Bat Bag is a great value that contains 450 pieces of candy and the MARS® Mad Scientist that I have pictures above has 290 pieces of candy. Both have a different mix of candy, so you can choose your favorite. 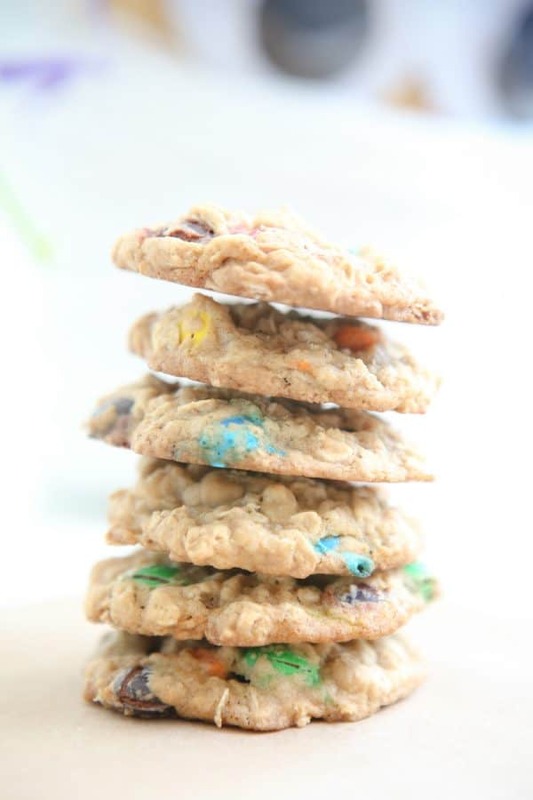 And here’s the recipe those Oatmeal M&M’S® Cookies. Enjoy! Heat oven to 350°. Combine sugar and butter in stand mixer and mix on medium speed until light in color and well combined Scrape down sides of mixer bowl as needed. Add egg and continue to mix until well incorporated. Sift together flour, baking soda and salt in a separate bowl. Slowly add flour mixture to stand mixer on low speed. Add vanilla. Continue to mix until well combined, but don't over mix. 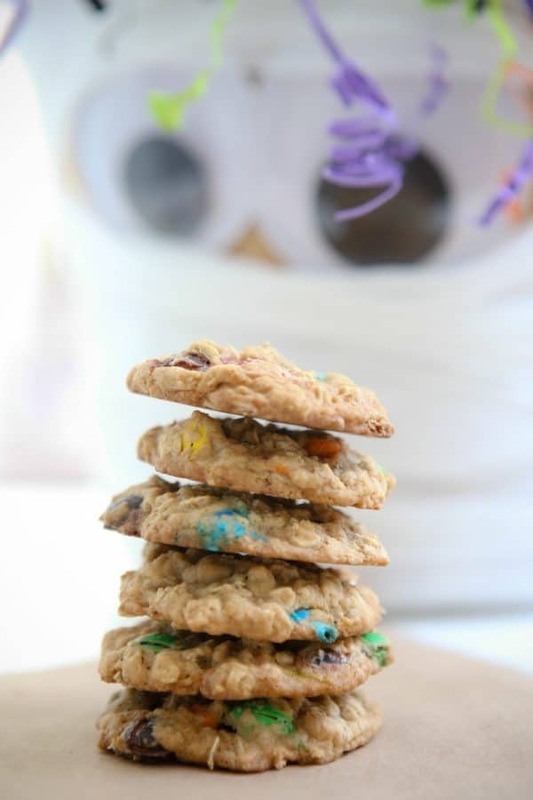 Add oatmeal and candies to cookie dough. Slowly mix or fold in. Drop cookie dough by the tablespoon, about 2 inches apart on a cookie sheet that has been lined with parchment paper. Bake cookies for 10 -11 minutes at 350°, or until just done. Remove from oven and let cool 5 minutes on cookie sheet before transferring on cooling rack. Let cookies cool completely before storing. Suddenly craving cookies 🙂 And how cute is that boo basket! Great job.